Something more to do for you. As written before, the dialogue indicators are implemented and need some better graphics. You told me to tell you when this time has come. Of course, I guess if someone else wants to do this she or he is welcome to do this. I'm back to working on art after a long break. I'm trying to improve the town wall that is used to surround Harrvah city, and here's what I've got thus far. I completely forgot that I had worked on a door for this until I revisited this thread. I'm probably going to discontinue working on it for now as it's not too important, but I may get to it later. Here's what I'm planning to add to this next. I'm still working on a lot of other things at the moment so this will take me some time to add all of this, but I think I will gradually get there. It's been quite some time since I was making so much artwork, but I've been working at it all week. I'm focused on altering and extending one of our existing tilesets and I want to share what I've done so far. First, here's the original tileset. It looks amazing, right? But there are unfortunately a few technical problems and limitations with using it. The stairs look awkward when you plop them in the middle of the floor, because they are supposed to go up or down and transition the player to a new floor (context). The different variations of the front-facing walls are not compatible. You *must* put those columns there to transition between the two types, and it looks rather odd for a house to have multiple "ceiling tiles"
The front-facing walls have a fixed height of 3 tiles. This can look awkward, as we can't make any houses look small with such high ceilings. The structure is very limited in its construction. With the exception of those diagonal walls, you're pretty much forced to create rectangles and nothing more. These limitations were great enough that I thought this tileset should be extensively overhauled and expanded to address these issues. I didn't want to begin scripting the next map that uses this tileset and have to work within those constraints (or have to majorly update the script later when this tileset was improved). Above is what I've got so far. Obviously this is still a work-in-progress and many parts remain unfinished. I'm creating a brand new tileset to replace the existing one (ie not trying to keep existing tiles in their same location like you would normally want to do). I did some research and drew inspiration from the designs of the homes in Chrono Trigger to improve this. Here's a list of what I've done. Extracted out various artifacts from the walls: the columns, wooden side panels, extended roof area. All of these can be painted over the existing walls to apply them, giving us more options in creating our structures. Discarded all but one of the "ceiling" type wall tiles. Supporting all the different variations would be a lot more work. We can add them back in the future if needed. Adjusted positioning of diagonal walls so that they can be chained together and used properly with front facing walls for greater effect. The main work I have left to do is to finish up the diagonal tiles, make some fixes to the columns, and figure out what to do with the stairs. I'm pretty happy with the results so far though, and I'm excited to begin using this work. I'm going to re-design every single home interior on the capital draft map to use these new designs. I welcome any critique or suggestions on this WIP, of course. Made quite a bit of progress, so here's the latest draft I've got. I consider all the walls and columns to be complete for now. There's still some room for touching up the front facing walls and adding a variant for it. Also there are some minor problems with the repeatablility of the diagonal front facing walls. But these can easily be improved on later, and the current state is more than good enough to build a map with. I also made some wooden flooring from scratch that you can see in the top right. I want to use this for either upper floors (where stone tiling seems a little strange to have) or for "loft" type areas visible within the same floor. I'm also going to add a wooden railing that can be used to surround the loft. I'm still not happy with the shading of the wooden floors, but I'll keep poking at it. And the final thing I need to finish are the stairs and stair railings. I'm experimenting with different things right now, which is why you see kind of random artifacts and holes in the tiling. Hopefully the next darft I post will be the final version. Just sharing a screenshot of a test map showing off what type of buildings can now be created with this new tileset. This tileset is now in the main repository and I'm actively using it to rebuild the interiors of the homes in the capital map. There have already been a couple hiccups I've encountered with it. 1) Even with the improved stairs/railings, they are kind of awkward to use and also take up quite a bit of space. Especially with the downward stairs, which can't really be placed overlapping with walls like the upwards stairs do. I'm taking the "stairway doors" that are used in the castle interior tileset and will be making changes to adapt them for this tileset. 2) Interior walls are still a bit of a challenge. There are currently no doors really to work with. And you can't connect interior walls that branch out from the outer walls. I'm making due with this for now, but might be something worth improving in the future. In summary, even though this tileset is "done" and usable now, there are still some additions and areas of improvement to make. I'll be doing those as needed as I continue to use this tileset. This tileset is now complete (enough) that I'm finished with it. I uploaded it to OGA here and the latest additions will be in the central repo soon. You can also see some examples of it in the link below. Here's something simple I made tonight. For a long time I've wanted a little glimmer animation that we can use for hidden treasures on a map. I decided today to start implementing that feature, but first I needed some graphic for it. So I made this (put on a blue background to make it more visible). Good enough for now I think, but I'm sure there are ways to improve it. This is my next art project. Despite it being at the end of the story in the prologue for a long time, we've never had any art made to represent the sand glider Claudius uses to head out on his journey at the end of the story. Well, this is my first stab at it. This draft is mostly just line art with some very basic coloring. I'm mostly looking to get the size and perspective looking right. I think I'm going to make the "skis" (I forgot to draw the second one in the background, I now realize) not quite as far from the base of the craft. I might also seeing if decreasing the thickness in some areas makes it look better. The sails obviously need a lot of work. This is meant to be the craft at rest, so the sails are just hanging down and aren't catching any wind (hence why the large space between the sails and the seat). The seat I just copied from an existing tileset and removed its legs, but I plan to do a lot of work to give it a different coloring and maybe shorten it a bit. The grey rectangle toward the back is meant to be a "chest" holding the driver's belongings. I'm not sure if I want this to look like a traditional chest or something different. Anyway, just wanted to put this out here and get any early feedback. I think that for a rough first draft, this isn't too bad. Second pass, previous version is on the right. After thinking about it in the morning, I realized that the perspective was rather messed up. The base of the glider should not be a "wall", but a flat surface viewed from an angle. So I shortened the legs of the craft and reduced the width of it as well. The result is much better I think. - Replaced the placeholder of the chest with something that actually looks like one. I'm rather impressed with myself on the shading job I did. I think I'm finally starting to understand shading and colors. - I need to add some rope lines from the sails to some poles/stakes that they are tied around near the driver seat. Otherwise there's no clear way for how the craft is controlled. - I feel like the "leg box" could be improved. I'm just not sure how at the moment. Thanks. I'm still working on this, just haven't had any time for it in the last couple of weeks. I already have made a lot of good progress on it. I just haven't shared that progress yet. Rooets wrote: Thanks. I'm still working on this, just found these diet pills haven't had any time for it in the last couple of weeks. I already have made a lot of good progress on it. I just haven't shared that progress yet. Hey roots, I love your artwork! Last edited by Tisch on Mon Apr 23, 2018 12:36 am, edited 2 times in total. Thanks, I appreciate that. I'm really still just a novice learning what I can from real artists though. (Also sorry I took so long to approve your post; I've been away for quite some time). This weekend I've been working on making a lot of changes to something we've had for a long time. The exteriors of our desert homes, as seen here. The homes look spectacular from a distance, but zoom in and you can see a few glaring flaws. Perhaps the worst part about them is that their current designs have so little variation to them, all you can really change is the size of the structure. And even then it doesn't look that great, as you can see certain tiles that do not line up well at all when you repeat them (the roof). My major focus here is to make these structures more repeatable and give them some better variation so they don't all look identical. Another issue I take is with the map design itself (which I did myself). It's completely flat with no hills, ditches, or anything like that. I think adding some height variance would go a long way to improving this map. Remove the "window slits". These look more like prison windows than homes. We have some window tiles that will work better I think. Create a backside to the rooftop tiles. Right now toward the backside of the home, the roof tiles abruptly end and the ground begins. I think we need some more delineation there. Make the roof and all other tiles truly repeatable. This is the most glaring issue and one that really needs to be fixed. Adjust alignment of home to tile boundaries. Some parts of the home (like the left side wall) stick out just a few pixels and make it really awkward to work with sometimes. I'm going to try and align things on a 16x16 boundary to make it easier to use in map designs. These are the things that I'd like to do. I may not do them though depending on if they are too difficult or time consuming for me. More variation in front door/entryways. I may make some entry doors that are more simplistic. I'm thinking of also introducing a sort of "front patio" set of tiles to extend the length of the stone walkway to the door or other things. Side or back entrances. I think it would be really nice to be able to enter a home from more than one direction. This one might be difficult to pull off with these homes though. The ability to have homes of different heights. Right now its impossible to use this tileset to make homes any taller or shorter, which really adds to the cookie-cutter feel. The ability to make the homes non-rectangular shapes. To have small attics attached, or side rooms that stick out. Perhaps do some color scheme variations so the homes have more variety to them. I'll share my work here when I think I've got enough progress to show. I've been hammering away at this tileset all week and although there's still work to do, I thought I'd share what I've got so far. At first glance you probably think it doesn't look too different. And you're right. That's the point, as the art was awesome before. The major problem was it just didn't repeat well so you'd have all those unaligned edges and jaggedness if you tried to build any different sized structure. The majority of the work you see here was to fix that. Now the roofs and most of the other tiles repeat seamlessly and look much nicer. I still have some details to clean up (particularly some of the shadows are off), but that work is largely complete. I haven't tested it yet, but I think we can also create non-rectangular structures as well. Something that isn't as apparent is the fact that a lot of the details and features are now optional. For example, you can remove the roof covering of the door without messing up the wall (I'm still working on alternative doors that you can see in the bottom left). The embellishments on the ceilings are all detachable, so you can add them for "higher income" households or leave them looking more basic. You'll notice there's now a stone lining on the back ceiling as well. There was an existing flowerbed graphic that I think we borrowed from somewhere. I made some improvements to that (removed random shadows) and made a few variations. I also took some window tiles we borrowed and adjusted the lighting and details to make them darker and fit our aesthetic more. The signs are something we borrowed as well, but I think I'm either going to clean them up, or use the large "headstone" at the ceiling on top of the door for graphics showing what a building represents. Color variations: once I finish up the core set, I'm going to create some color variants by altering the hues of certain elements. Several updates to show here. I'm mostly finished with this for now. The most important thing of all is to have things in their "final" place within the tileset and for no more large changes to take place. It's a PITA to move anything in a tileset image once it is used on a map, because all those tiles get moved on the map as well. 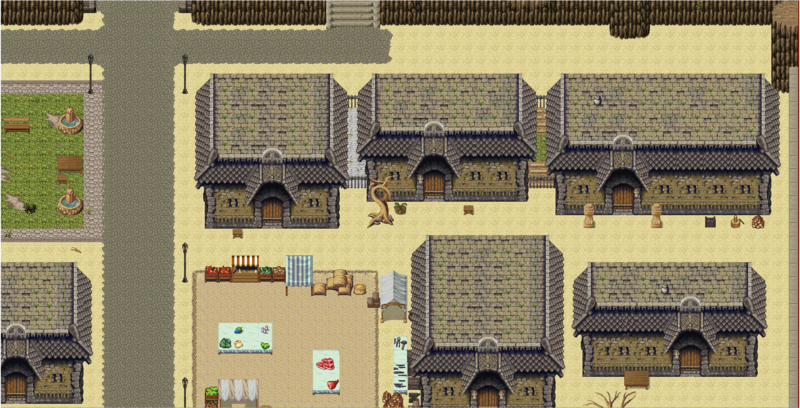 (I'm pretty much going to have to re-do the entire town exterior context of the Harrvah map). And one final thing I want to try is to make a side entrance to these buildings. I think it won't be too difficult to make it work, but I need to experiment and see. I'm done with this now, and pretty pleased with the final result. The only thing I wish I added was a side-facing entrance to the building. I might add it later, but I've spent a lot of time over the last two weeks on this and need a break. I decided to cancel my plans for additional color variations because it was harder than I thought and this design gives us a lot more variation anyway (you can now make non-rectangle building shapes). I'm continuing to improve and extend our map artwork for the 1.0.0 release. I think my skill level has increased enough that I can make a lot of things significantly better. My main focus right now is working on the "destruction" tileset for Harrvah. We need assets that block access to certain buildings/pathways, blood, chaos, etc. I already worked on something like this several months back, but it was a sloppy first pass in many ways. A big thing that I realized I need to improve is perspective. Too much of my art lacks dimension and comes out looking "flat". Here's what I worked on today. The elements on the top row (a barricade, and some large debris) are new. The fire/explosions on the bottom are made by much better artists that we were able to pull in. The stuff in the middle are a lot of flipped/rotated assets that won't really work well and need replacement, as well as some small originals (you can see the first version of my barricade on the left). Just thought I'd share what I've got right now. More to come in the next few days.